RCIN 1005113.w - The marriage of Krishna and Rukmini. The marriage of Krishna and Rukmini. 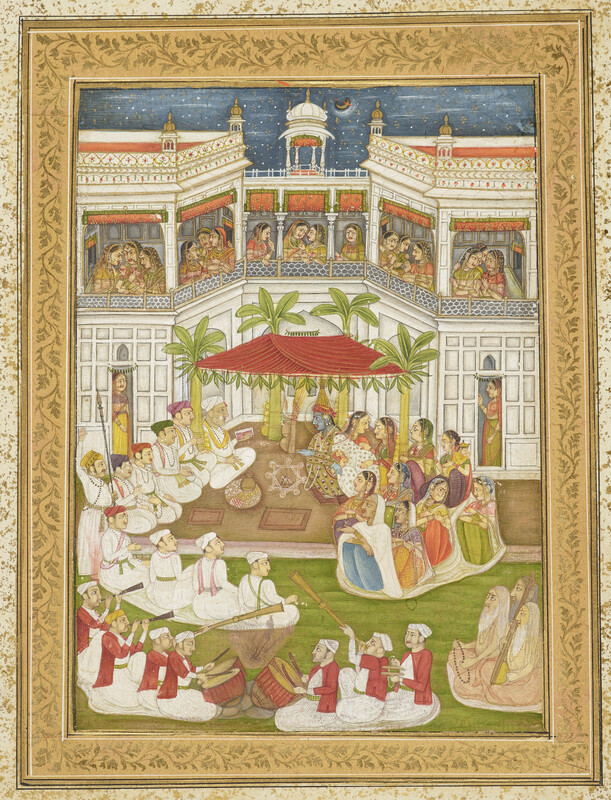 A depiction of the marriage of Krishna and Rukmini, conducted by moon- and starlight in a palace courtyard. Seated under a plantain-tree pandāl (temporary structure), Krishna wears a golden robe and pointed crown and holds the hand of heavily veiled Rukmini who sits beside him. To the right, the men sit in a semi-circle with a group of musicians behind them and three long-haired holy men on the right. The ladies of the palace zenānā watch and chatter away from the balconies above. In the centre is a holy alpanā diagram encircling a sacred flame.